Following weeks of discussion by the Regulatory Response Committee and the Ethics and Professional Issues Committee, then vetting by the Regional Directors, on September 6 NASBA Chair Mark P. Harris and President Ken L. Bishop sent a letter in response to exposure drafts released by the AICPA’s Professional Ethics Executive Committee and Accounting and Review Services Committee on June 29. 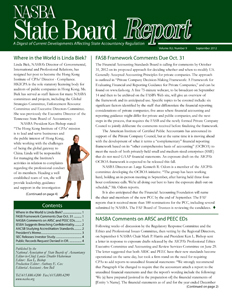 The letter suggested that both ARSC and PEEC have their new standards become operational on the same day, but took a firm stand on the need for requiring CPAs to add reports to unaudited financial statements: “We strongly recommend that Paragraph 4 be changed to require that the accountant attach a report to the unaudited financial statements and that the report’s wording include the following: “‘We (a) have prepared [assisted in the preparation of] the financial statements of [Entity’s Name]. The financial statements as of and for the year ended December31, 20XX, were not compiled, reviewed, or audited and, accordingly, we (I) do not express an opinion or any form of assurance on them. '” The NASBA comment letter also recommends that the legend “See Accountant’s Report” be placed on each page of the unaudited financial statements.